I knew that there was a good chance of snow early in the morning. Snow is always a possibility in March in the Rocky Mountains. Still, I was surprised when I heard the heavy wet flakes landing on my tent. I had set my alarm for 5:00 am but never heard it going off as I was so bundled in my sleeping bag trying to keep warm. I did hear Nathan already up and back from his hot shower. Then I heard the snow. I quickly dressed more layers over what I had been sleeping in, put on my big down coat that had been acting as a blanket. Gloves and a warm hat finished off my outfit and I unzipped the door to my one person tent. The rain fly was not staked out in my attempt to keep the warmer air in the tent. I unzipped the rain fly and was surprised at the amount of snow that had already fallen. The grass was covered and it was still snowing. This was our final day of a week adventure with nine high school students, the science teacher and myself. Nathan and I had spent the last six months planning, organizing, grant writing, campground reserving, applying for a backpacking permit, obtaining permission from the school board to take the students on an out of state trip, receiving student applications, picking students, going over gear list, borrowing gear, grocery shopping, parent permissions and finally, packing the little red bus and hitting the road. We had driven only 40 minutes south on highway 93 and crossed into Idaho when one of the students told us that they had never been this far before. It was at that moment it occurred to me that this was much bigger than just a road trip to the Grand Canyon. We drove to our half way point of Fillmore, Utah where we had reservations at the KOA. We weren’t the only people staying there, but we were the only tent campers. This was a good practice night for the kids for setting up their tents and getting their gear organized. It was also a good night for Nathan to see who would need a better and lighter tent and who would need a warmer sleeping bag. We had an age range of 14 to 18, three boys, six girls. We had one exchange student from Germany. The younger girls were giggly and silly, the older girls quiet and observant. The one senior girl was the leader. One boy had his head phones on, one boy was outdoorsy and confident in the adventure and the center of attention for the six girls. The last boy never stopped taking pictures. Everything was new and different. He took pictures of the scenery out the bus window, he took pictures of the signs in the bathroom at the KOA. This kid was beaming with excitement and he drove us nuts. 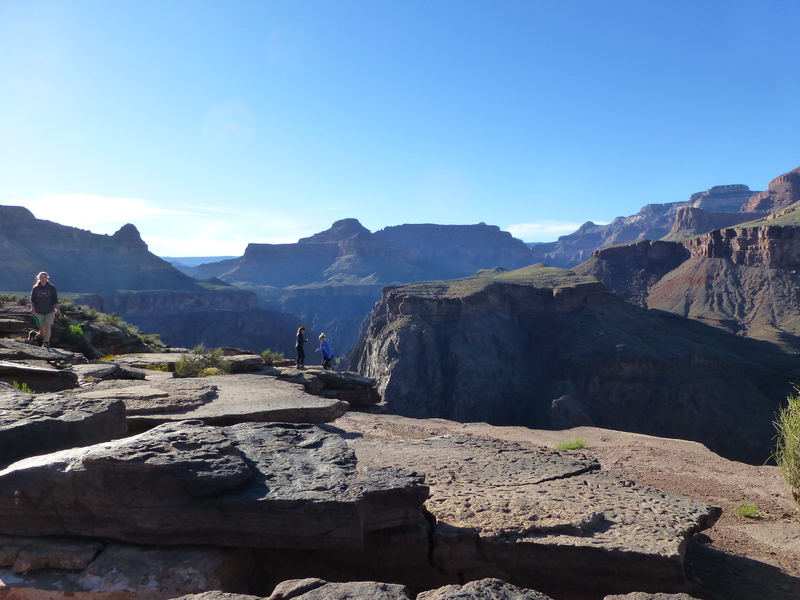 On the afternoon of the second long day on the bus, we arrived at the Grand Canyon. We stopped at the first observation point. I knew that there would be crowds of people, the kids did not. They were astounded at the number of people walking around, taking pictures, reading the interpretive signs. The kids left the bus and spread out among the crowd. We rounded them up and told them that we needed to stay together, this couldn’t be a free for all like they were used to. Our first night’s stay in the Grand Canyon National Park was in Mather Campground, right in the heart of the Grand Canyon Village. There are 306 campsites and the campground was full. If Mather Campground averaged 3 campers per site, then there were more people in this campground than in our town of Darby. We woke up early, made some breakfast burritos and packed for a 3-day backpacking trip. 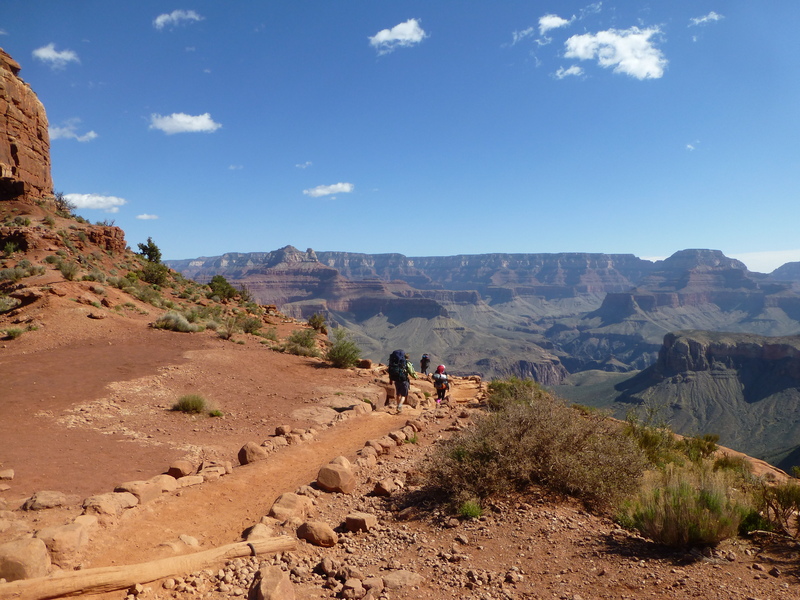 We drove to the back country office to park the bus and catch the park bus to South Kaibab Trailhead. The bus was full and the 11 of us were the only people with backpacks on. Everyone on the bus wanted to know our story and started asking questions. Where were we from, how many days would we be out? They were impressed that this was a high school group out on an adventure for spring break. Day one was a hike from the rim to the river. All downhill, lots of switchbacks and plenty of photo opportunities. 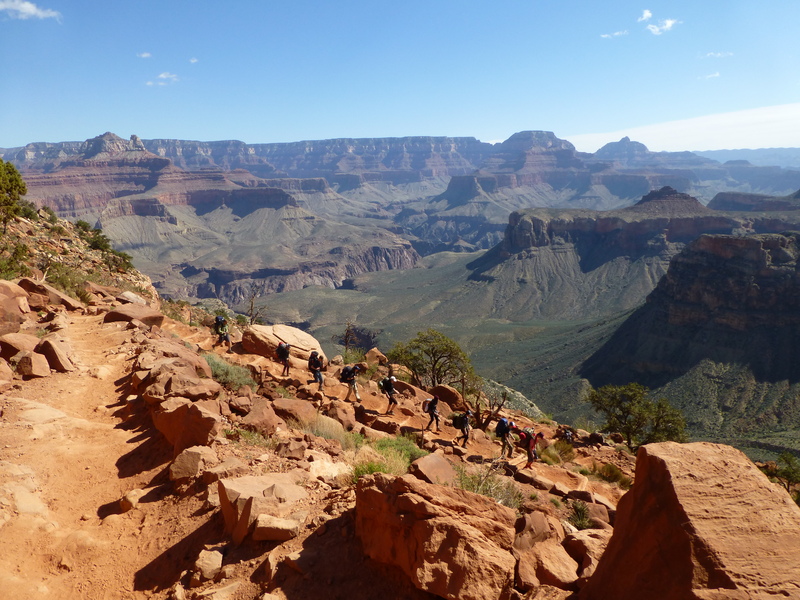 The kids quickly descended into the canyon, fulfilling their need to always be on the next agenda item. I was fulfilling my need to not fall over and look like a beetle stuck on my back with arms and legs flailing or worse fall and roll 4750 feet down into the Colorado River. I slowly descended into the canyon. We left the rim shivering in the cool air and arrived at the river to a nice 70 degrees. I will lose both of my big toe toe nails from this hike but it was worth it. The kids were already dreading the climb out and I was thrilled to not go down hill anymore. Our campground was delightful. We were camped up next to a sheer cliff to one side and Bright Angel creek on the other side. We took an evening hike up to Phantom overlook hoping for a spectacular sunset. The sun went behind a big rock. It was anticlimactic but still a beautiful setting to be in. The evening was warm as the nearly full moon came up and lit up our site so much that headlamps were not necessary. We let the kids sleep in for the first time since the start of our trip. As they got up we heated water and they tasted their different Mountain House backpacking meals. Eggs and sausage, biscuits and gravy, granola and milk; all rehydrated with water. We were on the trail by 9:00. The morning started out gradual and the trail stayed just above the river and in the shade. We started climbing up the switchbacks in a narrow canyon and stayed in the shade most of the day. The first downhill people we saw were trail runners. They had started out in the early morning, in the dark, hoping to beat the heat and the crowds. We got to a point where we were done. Not to our destination, but just done. We finished off water and snacks, read the description in the book, trying to figure out how much further to Indian Garden campground. All that rest, snacks, and reading and the campground ended up being around the next corner. The lead hikers of our group had already found a group site and had set up their tents. We were so happy to take off our packs. The kids quickly set up the rest of their tents, rehydrated some lunch and then got in their tents for a nap. The day had never really warmed up. We were just warm from uphill hiking. You had to be in the sun or in your sleeping bag to cut the chill in the air. The kids napped, I read and Nathan scouted out a trail for our evening hike. Nathan never stops. He’s always busy with something. I asked him why he works so hard, goes home late, leaves early the next morning and then does it all again. Some nights he doesn’t go home at all, he goes to the hospital and works all night in the emergency room. His answer was that his dad told him to always leave a place better than he found it. I thought he was referring to our campsite; but he meant the world, he needs to leave it better than he found it. That’s Nathan’s drive. I think he’s succeeded multiple times over. Nathan will never be done leaving this place better than he found it. Our evening hike was a nice flat out and back to an overlook. We were already half way up the canyon. From the overlook, we could see the river at the bottom and the rim at the top. The perfect location to watch the sun go down. Everyone was goofy, sore, and in awe of the beauty surrounding us. We hung out at the overlook for a long time, talking, taking photos and then the yoga poses started. It wasn’t even my idea. Headstands, dancer, backbends, double down dog, and a triple layer plank. Then someone came up with the idea of a backbend with someone else in bow pose on the back benders belly. It never worked and the photos look a bit pornographic. We all howled with laughter as this tower of inverted belly’s would come crashing down onto the rock. These are the kinds of moments that you can’t plan, expect or describe; they just happen when you go on an adventure with nine kids and two adults. The kids told Nathan and I that we weren’t old (although we were older than most of their parents), we weren’t old because we still do fun stuff. We walked back to the campsite to rehydrate some dinner. The kids were starving and ran out ahead while Nathan took pictures of everything from the scenery to the blooming cactuses, to a Montana shaped rock. We managed to eat before dark for the first time, but just barely. As it got dark we looked up at the rim and could see the parking lot lights for Bright Angel Trailhead. The next morning it was still dark when I heard the first trail runners go by. Then just as I was getting up I heard a gentleman trying to talk on his cell phone on the trail. The connection must not have been great so he talked louder as the rest of the campground got to wake up to this man’s cell phone conversation. It was a chilly morning. The kids were up, fed, packed and on the trail before 8:00. Another day of switch backs and climbing. We were going just over four miles and climbing 3000 feet. I had them divide the day up into thirds based on the two restrooms along the way, trying to make the hike seem less arduous. The closer we got to the rim the busier the trail got. The day hikers didn’t need a permit and could come and go any distance they wanted. For two hours people were telling us we were almost there. It was slow going and lots of breaks, but we weren’t in any hurry, except for the desire to be done hauling our stuff on our backs. We spoke to the people as we went by them. They would step to the side to let us by. I wasn’t sure if they were afraid of us knocking them over with our bulky packs or if we smelled like we were on our third day of hiking. They asked us questions and treated us like hiking super heroes. The trail got busier and the people weren’t as friendly. We were just in their way at this point. The people walked on both sides of the narrow trail and we would have to stop to let them by. After four hours, averaging 1 mile an hour we reached the top. Back to the world of traffic, exhaust, flush toilets, gift shops, cell phone service and meals that had not been dehydrated. The kids were thrilled. Nathan walked to our bus and drove it back to pick us up. We found our group campground site. Once again Mather campground was full. The kids struggled with what to do first; eat, shower, buy coffee, charge their phones, nap. They managed to get it all in and then eat again. Nathan and I had to throw in one more evening hike. We stopped at the store on the way to satisfy the kids desire to purchase stuff and then continued in the dark to the rim trail. We laid on the trail and watched the stars, planets, planes and satellites. The kids asked Nathan star questions and then those questions turned into existential questions and then to interstellar travel and time questions. Wonder and what if; the kids were full of those questions. I was getting cold laying there so we started walking along the trail. We were waiting for the moon to come up which it did. It lit up the canyon and our trail. We looked down where we had come from that morning and could see the headlamps of the people eating their rehydrated meals at Indian Garden campground. Life begins at the end of your comfort zone. We were in a zone for sure. A trip like this is planned with list and itineraries and books with descriptions. The real trip is not the list or the planned events. The real trip is what happens in limbo. The experience you take back with you is not explained in books, the experience is bigger than that. You have a hard time explaining the comradery that forms within a group during a strenuous outdoor adventure. This adventure was very meditative. It takes you out of your daily routine. You couldn’t help but be in the moment, focusing on nothing but the adventure. Your head is cleared of the clutter and drama of unimportant issues and stays tuned into the present moment. The transition back is not an easy one and should be done gradually. Cell phones make this gradual transition virtually impossible. You return home in a peaceful melancholic funk, to a world of perceived time crunches and life sucking drama. That’s what’s exhausting; not hiking in and out of the Grand Canyon. Thanks for reading. Find more great adventure stories as well as highly recommended books by visiting the Wild About Books Blog.